The first display sets the tone. Although placed too high for me to photograph without much distortion……, it is a handwritten 19th-century rental contract between 12-year-old Margaret Alsager and her father, setting out rules for her doll house. For one shilling a month, Margaret agreed to such things as “only using flames made of red foil, wool or glass” and never lighting candles in her doll house. This is one part of an exhibit, called Small Worlds, from the collection of the V&A Museum of Childhood in London, running until June 17 at the Museum of Decorative Arts in Prague. Many of the houses are from the 17th and 18th centuries and were created in often elaborate cabinets, passed down for generations. Oldest house in the collection dates to the 1700s. 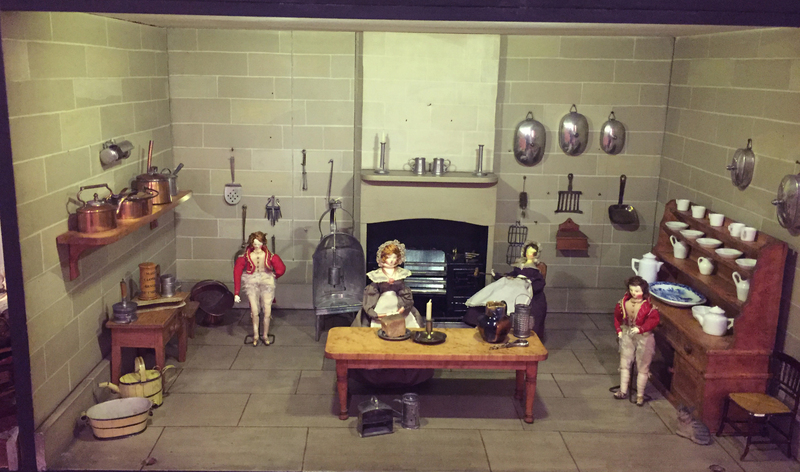 The oldest house in the collection, from the 1700s, was a gift from surgeon John Egerton Killer to his wife and daughters for the miniatures they had been collecting. In a large Chinese cabinet, this house stayed in the family for 170 years before the last owner, who had no children, gave it to the museum when she died in the early 1900s. The Tate Baby House, as it’s called, is one of the most famous in the collection, another that was handed down from mother to daughter. It has been redecorated several times. Victorian bathrooms varied depending what part of the era they represented. Middle class Victorian homes seem unusually large, at least their doll house counterparts do. Descriptions include how the home was “an antidote to trouble and the immortal dangers of the outside world” for men and, for the wife, who is described as the “angel of the house,” a place where she “managed the household and cared for and nurtured the whole family.” For this reason, Victorian homes have space for “families to spend time together but also apart” — thus the billiards room and the nursery. Another from the 1870s can be viewer from both sides with doors and walls opening to provide access. Known as a “council home,” this later type of house was widespread between 1919 and 1939. As the description says, “New government standards ensured all homes were well built. Thousands [of city dwellers] were relocated from unsanitary city slums to newly created green suburbs on the fringes of London.” Also said this was the first time many tenants experienced fresh air, indoor plumbing and private gardens. The owner of the one on display included her memory of war time with gas masks, identity cards and even a chicken. The details in the Line house bathroom represented the time. Also little bit newer — but still not new — is Peggy Line’s house from the 1930s. Her father ran an internationally noted toy company, so he commissioned a house to be made like her childhood home in Surrey, which had been build at the turn of the century. That sociological description of my world seemed clinical to one who has lived it, and the computers, microwaves and televisions in the models didn’t have the same appeal the older ones did. No photos of those houses are included here. Details in the Line house are carefully crafted. A man’s refuge in the Victorian Era, this home even has a billiards room. The Line house staircase allowed access to all parts of the house. 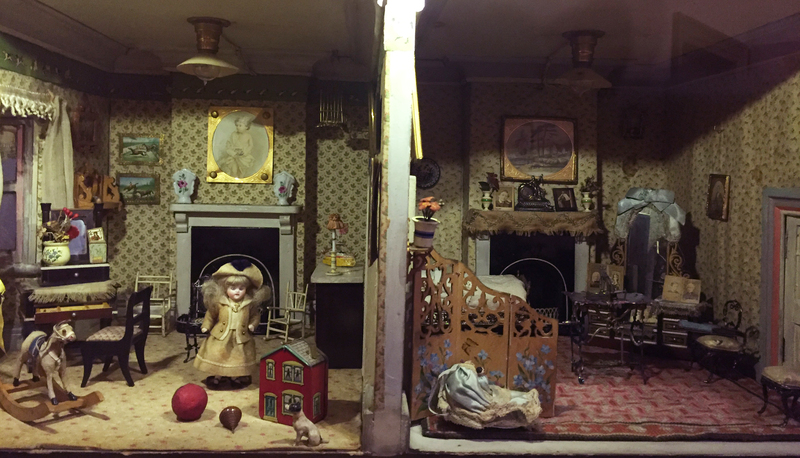 Peggy Line’s house was commissioned by her father, a famous toy maker. Oldest house in the collection from the 1700s was probably decorated with scraps of the owners’ own wallpaper. Stairway to a real plus of these council homes — an indoor bathroom with running water. The owner of this house captured much of what she remembered as a child during WWII. Much of this 1760s Tate Baby House opens to provide access. Even the British flag decorates the house from 1936. 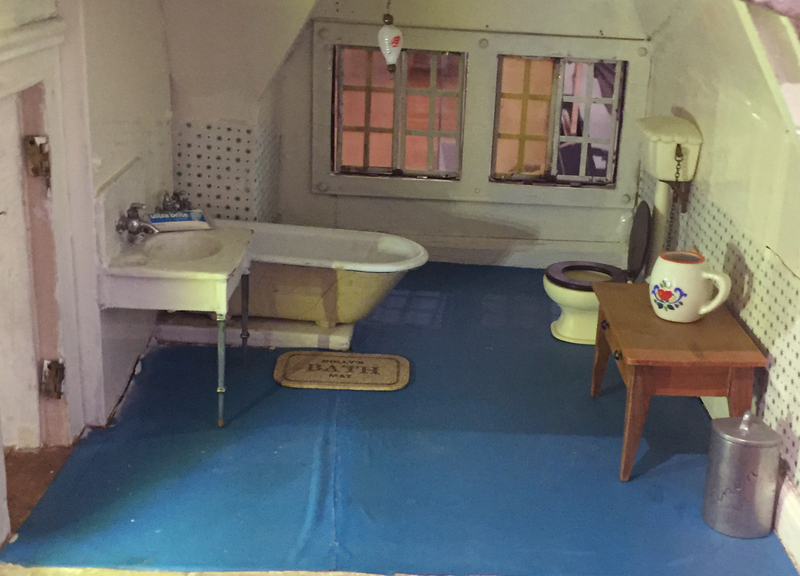 The Tate Baby house, as this is called, is one of the most famous in the collection. 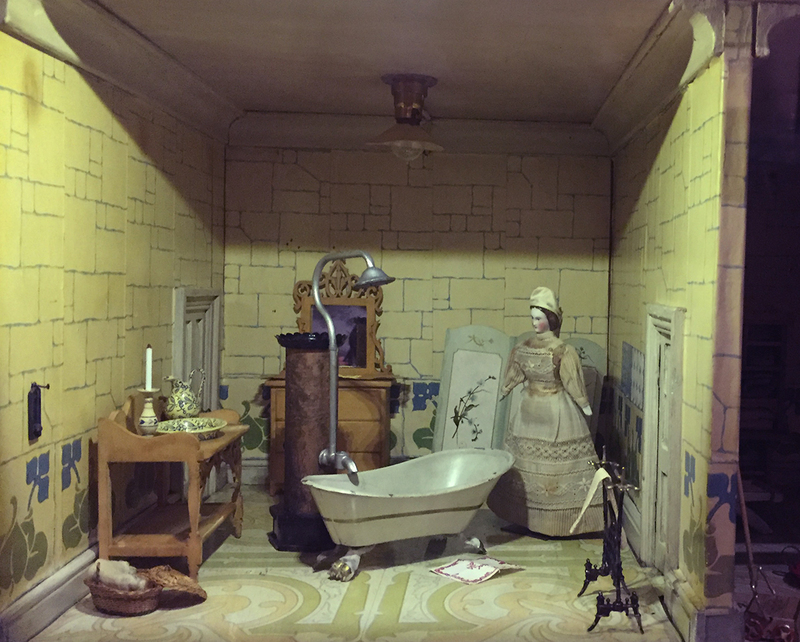 This entry was posted in Uncategorized and tagged Doll houses, Museum of Decorative Arts, Prague, Small World by Candace Perkins Bowen. Bookmark the permalink. Dr. Killer? Really??? But seriously, these had to be fascinating for you to see. Post captures that!